In the previous article of this series, I talked about how travel is continuously transforming my personality and how it helped me, love, plus respect this ONE life to keep feeling “Alive is Awesome”. Do not forget to check my last article on How Travel Transformed and Made Me Feel – Alive is Awesome. 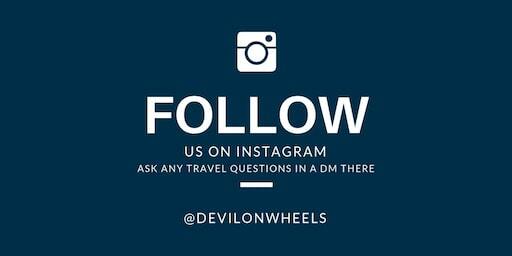 Let me share the top reasons why I travel and continue to travel in life even after 10 years of solace. I Travel because Travel gives me a reason to believe that I can climb that 4000 Mtrs peak even though I could barely jog for more than 10 minutes. Travel gives me a reason to believe in myself that I can stand, hold calm enough even if it is a life-saving situation at 14000 feet. Travel gives me a reason to believe in myself. 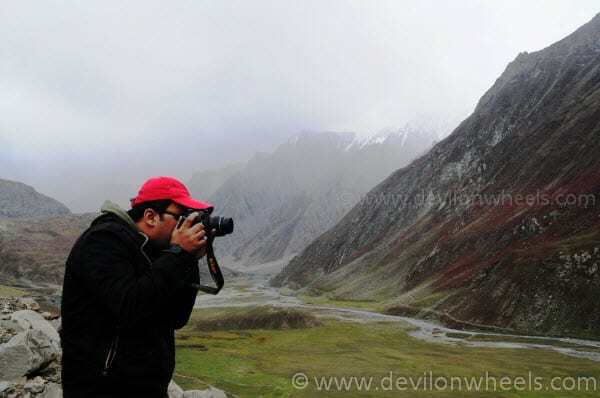 I Travel because Travel gives me a reason to smile even after hiking long trails and going through all pains but that wonderful panoramic snow clad mountains from the vantage point take the pain away and bring a true smile back on the face. Travel gives me a reason to smile every day when I come home after a longish frustrating day at the office and I see that one glimpse of a picture held on the walls of living room taken on some past Travel Trip. I Travel because Travel gives me a reason to love mother nature even though it lets me go through the harshest of AMS prone terrain. Travel gives me a reason to love flora and fauna around as I know more about their importance of existence to this land of ours. Travel gives me a reason to love so many stories of other Travel mates or partners who sail much like the same boat I am in this life. Travel gives me a reason to love this one and only life. I Travel because Travel gives me a reason to learn some of the most fantastic things including culture, landscapes, native people, terrain about the places I visit. Travel gives me a reason to learn how to drive in most difficult of terrains and be composed. Travel gives me a reason to learn how to click some picture better than the last trip. Travel gives me a reason to learn about survival in different parts of the world. Travel gives me a reason to learn how weather changes in various parts of my country. I Travel because Travel gives me a reason to connect with some of the most amazing human beings who Travel with a passion much like mine, human beings who breathe about Travel. Travel gives me a reason to connect with some lovely human beings who keep on motivating me further to Travel with their warm wishes and praising words. Travel gives me a reason to connect with so many devotees looking forward to any kind of inputs/help over some of the ill-managed pilgrimage websites. Travel gives me a reason to connect with so many readers who support this blog through their unending love. Travel gives me a reason to connect with so many wonderful humans on earth other than those who are already known to me. 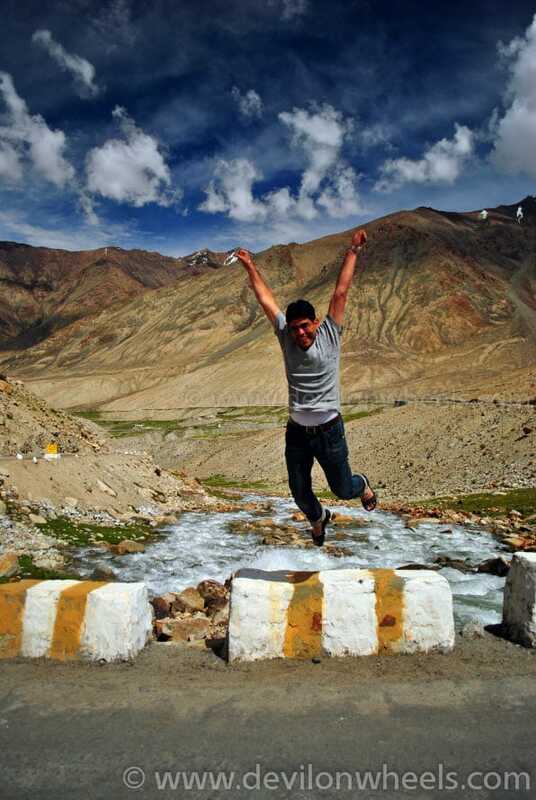 I Travel because Travel gives me a reason to feel alive running through some majestic vistas of the Himalayan range. Travel gives me a reason to feel alive experiencing some happiest of moments with my travel mates even after having a flat tire in the middle of nowhere with freezing temperatures. Travel gives me a reason to feel alive even after I am not Traveling but writing and sharing my Travel experiences and related information with many others seeking the same info. In the end, Travel gives me a reason to feel ALIVE, a reason to feel AWESOME. Thank you so much. Yeah, it happens sometimes :), planning works too but it sometimes otherwise. I am glad you liked the pictures. This was a nice reading. 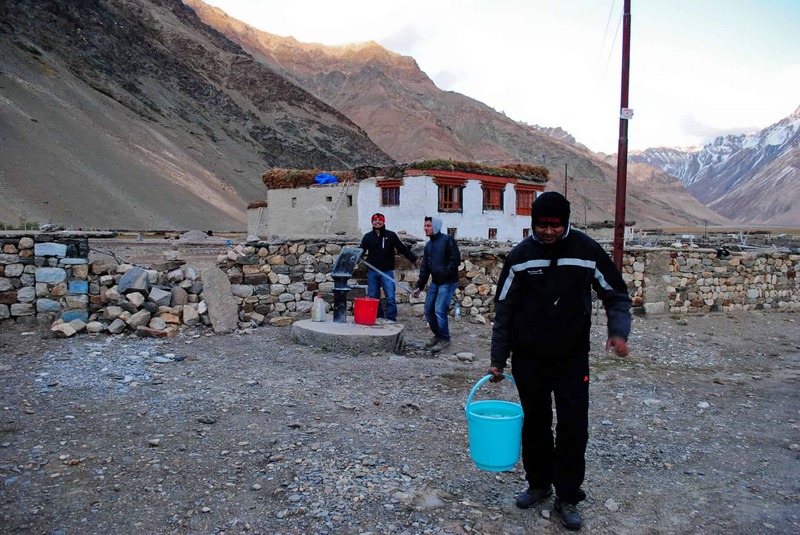 I like your travel stories from ladakh. I will be planning a trip in search of snow leopard. Hi Dheeraj:) Excellent article & I’ve been reading quite a few of them. Really impressive. Although Dheeraj, I would appreciate it greatly if you could suggest the best month to do a Srinagar-Leh-Manali trip on a motorbike. Shall await your response. Thanks, Kiran. 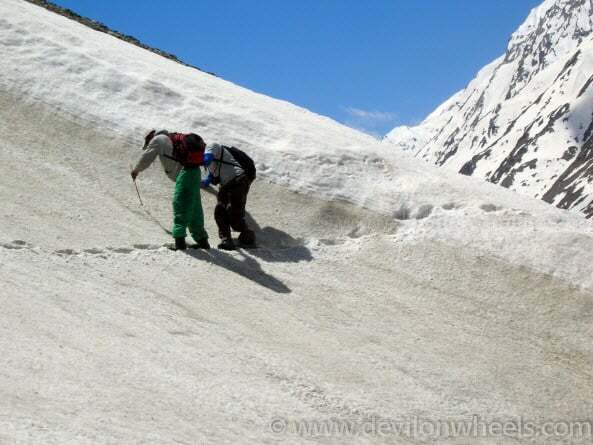 It is always nice to plan your journey in last 10 days of June or first 2-3 weeks of July when you can find ample of snow on roads and roads will be open by that time from both Srinagar as well as Manali sides to Leh. 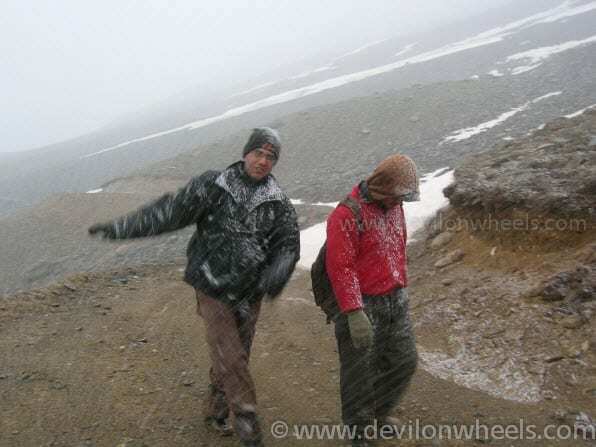 Now, please keep in mind that road conditions hardly improve on Manali – Leh road and remains almost quite challenging + adventurous all throughout the season. It improves slightly towards the end of season that is September or October first week but by that time snow is all gone. 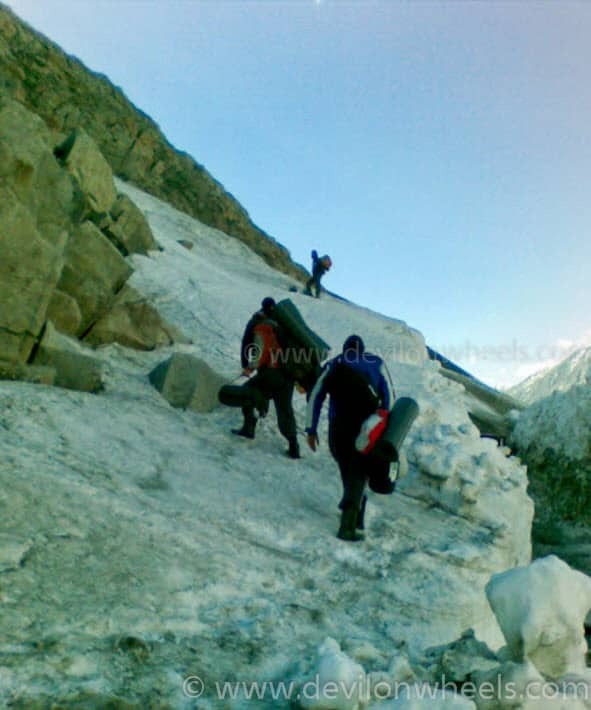 So, you need to be prepared for all the adventure that Manali – Leh Highway present to a traveller in the month of June – July and situation worsens when monsoon comes in late July and August. So IMHO, overall whatever best window you will get so that you avoid monsoons, see ample of snow and roads are open for you will be like 20th June – 20th July window. 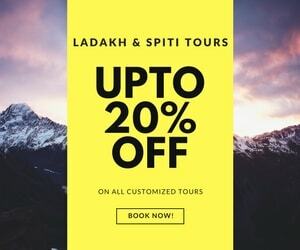 If you want to see beautiful colours of Ladakh then second half of September is THE best time to visit Ladakh when these colours are oozing out vividly and of course, the road conditions does get better in late September type when rains reside the region completely. Dheeraj… You are so precise. It’s just so nice to have someone like you share knowledge selflessly & help others whom you may not even know. Thanks a Gallon. Those who like to travel, sometimes, do not get a chance, they only imagine , read, and try to feel good. Some who travel a lot hate it and wait to get home. but , you have the desire and the opportunity, and the will power. You are enjoying this, and also giving us readers a lot of joy, reading about your good times.